I adore paisley! Love all of the colors and the style of your work so very much. 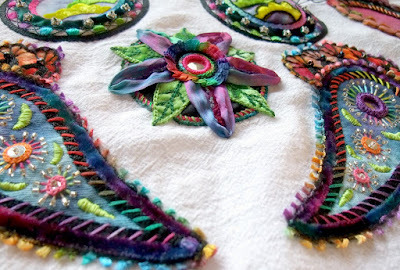 Your beautiful work in these vibrant hues makes me miss embroidery work. However, I think it's best to leave it to you, because you are the BEST! The intense colours and lovely textures in the applique are glorious! Your embroidery is looking amazing! i would wear this blouse in a hot second!